It's hard this week to remember a time both children weren't ill, to think back to a time when they weren't both crying and moaning. At one time or another both my babies have had to be collected from school and nursery with a temperature. 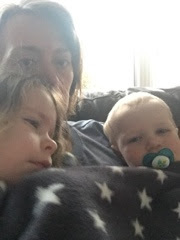 They have both clambered all over me, seemingly unable to sit anywhere other than on mummy. Both have been up in the night, different nights and so the endless long nights have been exactly that...endless! It's difficult dealing with one unwell baby but when they are both unable to cope and crying it's hard. Harder than I expected, I feel broken and tired...oh so tired. But I love that I can provide transient comfort and that they believe that mummy csn make it better. At the same time it's hard that I can't always make it better. My girl is on the mend and back at school but my poorly little boy isn't getting better just yet. I'm hoping he turns the corner soon as I miss his relaxed and fun nature. I miss the constant smiles and cheekiness. For now I'll comfort and provide the 'cuggles' as and when they are needed.